Arizona Technology Council member Phoenix Analysis & Design Technologies, Inc. (PADT), released big news last week with the announcement that it acquired the Stratasys 3D Printer reseller business of Boulder, Colorado-based CADCAM Systems. 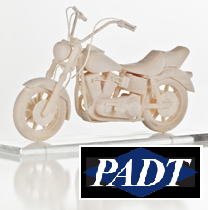 The move immediately boosts PADT’s printer sales and support business by 30 percent with new customers in Colorado, Utah and New Mexico, making PADT the largest provider of industrial 3D printing solutions in the Four Corners region. PADT is especially excited about the acquisition, as it has been aggressively expanding in the three states where CADCAM’s Stratasys customers were most concentrated. This addition to PADT also allows it to build an even larger and more connected community of mechanical engineering experts, and offer even stronger support to its valued customers. As a visionary leader in 3D printing, Stratasys makes a wide variety of 3D production systems designed to support virtually every industry, including various 3D printers that can handlea wide variety of engineering materials, print in color, and produce industrial size, multi-material parts. Stratasys boasts the largest installed base of 3D printers in the world, partnering with certified resellers like PADT to provide 3D printing, rapid prototyping, and additive manufacturing solutions. PADT is thrilled to represent such a well-respected leader in the field. As indicated by its motto, “We Make Innovation Work,” PADT is utterly committed to providing the best possible mechanical engineering services and products. The acquisition continues the company’s trend of making the investments necessary to allow it to continue its position as the Southwest’s largest provider of numerical simulation, product development and 3D printing services and products.